Here are examples of using the media to highlight our concerns leading up to the Inquiry. See also our pages on the media coverage of The Inquiry into School Libraries and Teacher Librarians and articles published by Hubbers. October 2009 Teacher Librarians, A dying breed? by Carol Keeble, NSW CBC president, in News and Views, quarterly newsletter of the NSW CBC, Vol. 2 2009. 7 September 2009 Letter to NSW Teachers Federation newsletter about the dangers of flexible staffing. 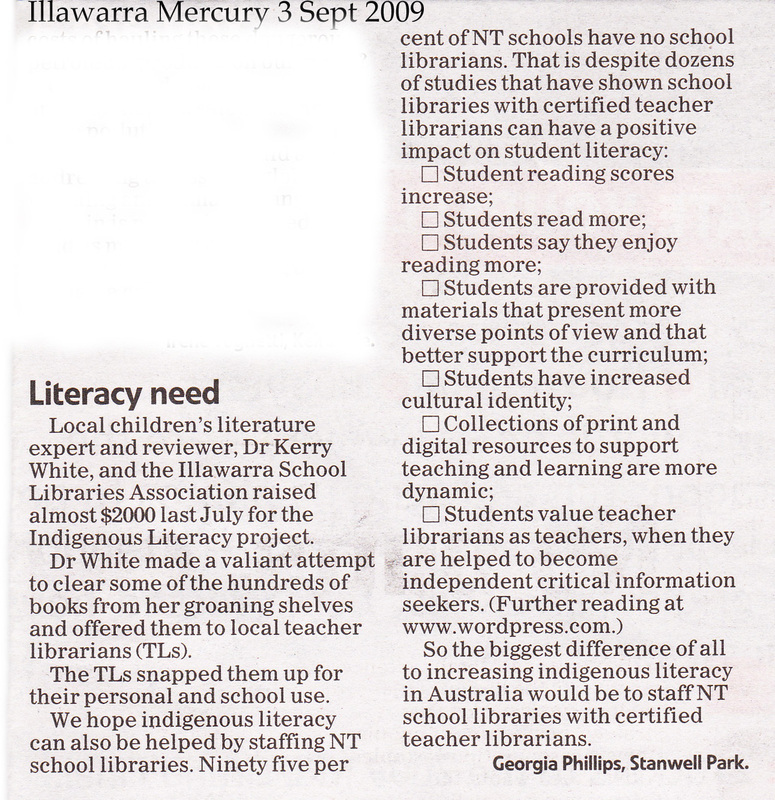 3 September 2009 Letter to the Editor, Indigenous Literacy and TLs in the NT. 22 July 2009 Mary Manning from the School Library Association of Victoria is interviewed by Life Matters’ Richard Eady on the decline of school library funding and staffing, especially in Victoria. 7 July 2009 ALIA President, Jan Richards, begins a dialogue in the Sydney Morning Herald‘s letters to the editor pages. 26 November 2008 Ex-Hubber, Liza Moss, gets her letter to the SMH editor published. Good one, Liza! May I offer a suggestion to address Australia’s fall in reading literacy (Letters, November 25)? If funding for public schools was increased, results would probably improve, but if money was earmarked for school libraries, they definitely would. Research shows that the size and quality of a library, and the qualifications of its staff, affect student results regardless of socio-economic background or other variables. Private school libraries are winning architectural awards and often enjoy high staffing levels. In contrast, public school libraries are being starved of funds and work with increasingly poor staffing ratios. Libraries have an important role to play in literacy, but are overlooked in favour of expensive computers in an education revolution that is failing to deliver any meaningful benefit. 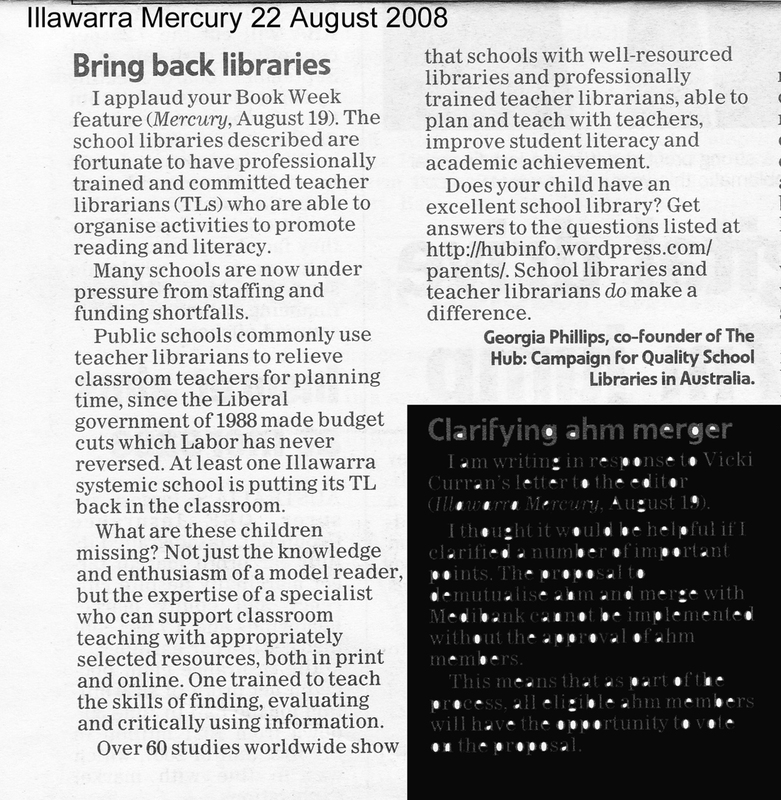 15 September 2008 Hubber Sharon McGuinness writes a feature for the NSW Teachers Federation Journal, Focus on School Libraries, linked to IASL’s School Library Day. 31 August 2008 Is Fiji’s Ministry of Education ahead of ours?? Their deputy secretary says there is no better place to learn than school libraries. See Fiji Times online. 26 August 2008 in response to Vic Minister of Ed on improving underperforming schools. 19 July 2008 Kerry Neary’s Letter to the Editor published by the Brisbane Courier Mail. 15 July 2008 Sharon McGuinness speaks on Radio National’s Perspectives about the role of a primary teacher librarian today. 23 May 2008, (31, 4). Queensland Teachers’ Journal edited version of previous article by Kerry Neary. 8th August: A Letter to the Editor in Wollongong, NSW, in response to the teachers union announcement of a campaign for more teacher relief planning time. 4th August: Advocate Sharon has emailed the editor of the ‘My Career’ supp in SMH, requesting a feature on TLs and school libraries to coincide with ISL Day and to encourage new recruits to the profession!! 2nd August: An emailed response to Yahoo7Sunrise. 1st August: A recent media release from Advocate Leonie.